While universities around the world are trying to promote freedom of expression and invest in the development of their students, in the case of Pakistan, higher education institutions are stifling debate, cracking down on any independent thought and churning out automatons by the hundreds. For instance, they are more focused on wasting paper with unoriginal research papers, as former students of University of Engineering and Technology (UET) were recently caught plagiarising a whole paper verbatim and almost got away with having it published. International Islamic University Islamabad (IIUI) has stopped its students from celebrating Pakhtun culture day, while Punjab University arrested students for protesting its administration’s decision to hand over its grounds to a madrassa. To add to this misery, universities also promote patriarchal and sexist stereotypes. 2/ Yes, shame on #Elsevier & its editors, and sure plagiarism has become an epidemic, but deepest shame on #ZaeemAslam & co. As a Pakistani who went to UET and works in a related field, I feel personally ashamed, deeply offended, and so very angry! Recently, Bahria University barred its female students from entering the campus from the same gate as its male students; it further asked both sexes to maintain a minimum distance of six inches between each other. IIUI, on the other hand, hosted job fairs on two different days to prevent the two sexes from mingling. Moreover, other universities make ambiguous dress policies that allow them to dictate what female students can and cannot wear, while male students largely remain unscathed from these policies and actions. While National University of Sciences and Technology (NUST) deems itself prestigious and modern, but it too promotes these stereotypes. It has separate curfew timings for boys and girls hostels and there have been numerous incidents where female students have been harassed and asked personally invasive questions by the guards at these hostels. This semester, NUST announced designated areas for smoking, but only for male students. If any female student is caught smoking in these areas, she would be fined and her parents/guardians would be informed. @rafiazakaria @yusaf_khan not to mention NUST casually also decides curfew for boys 11pm but girls 9:30pm. Discrimination? Who cares. When the students protested against this blatantly sexist policy or vented out on social media, they were reported to the respective heads of their departments, some have even been told their degrees will be withheld. Furthermore, to shield itself from litigation, the university makes each student sign a disclaimer so students can never even sue the university. This collective ignorance that women don’t smoke or women shouldn’t smoke is prevalent in this country. Last year, Mahira Khan caused uproar when pictures of her smoking were plastered all over the internet. People started worrying about her character, lungs, threat of cancer but there was no ‘concern’ shown for Ranbir Kapoor, who was standing beside her and also smoking. Since everyone's talking about @Official_NUST , The university has a horrible reputation when it comes to protecting the rights of their students. if you complain regarding ANYTHING unfair, they threaten to take your degree away. Someone once said that smoking damages a man’s lungs and ruins a woman’s character; it seems our society is proving it to be true. Volumes of research shows that smoking is injurious to health, so why is this vital piece of information thrown at women only whilst majority of the smokers are men. Health doesn’t see gender, then why is a university concerned about one set of students and not the others? Do the male students have special powers that will stop them from coughing up their lungs in the near future or are they unloved by the administration? Why is NUST so concerned about its female students that it threatens to call their guardians, if they are even found in these smoking areas, let alone found smoking? We live in a country where women are constantly harassed; they feel unsafe in public areas, they are killed in the name of ‘honour’, and under these circumstances, a prestigious university is threatening to call their guardians. Will the university claim any responsibility if God forbid any harm befalls its students? Nust finally accommodates smokers with its designated areas, BUT, only if you’re a man. Smoking is a health concern if you’re a man, BUT a moral issue if you’re a woman. Aurat kay pass lungs ki jaga bhi, khaandan ki izzat lagi hoi hoti hai! It is sad that in this day and age, universities like NUST care more about their ‘good name’ and bow down to patriarchal norms. This policy is nothing but sexist in nature, designed to promote problematic gender stereotypes that women don’t smoke and that boys have a special set of rules provided to them due to their male privilege. 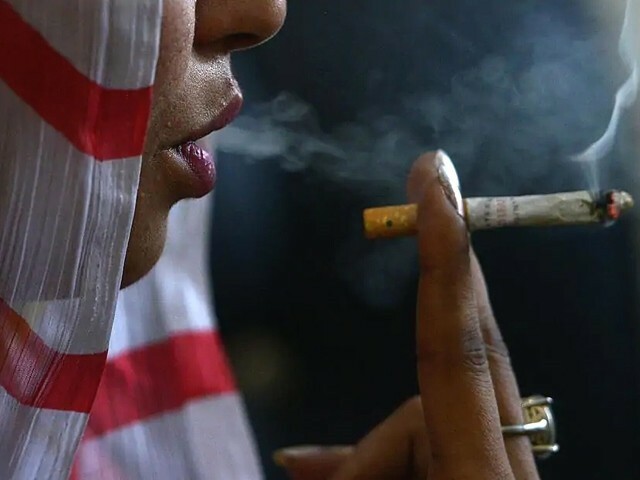 Research shows that roughly 6% of the young female population smokes in this country. The number is probably higher since some women choose to hide their smoking habits due to the probable consequences they would have to face if caught smoking. These policies won’t be able to force women to stop; they will continue doing so as is their right. Sadly, it is our society that loses out in the end because it refuses to acknowledge that half of its population has a mind of its own – they exist!